News from LMCU: Use Max and Save on Gas! Use Max and Save on Gas! 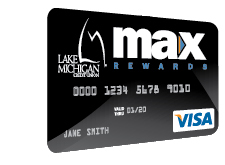 As gas prices go up, make sure you use your Max Rewards Platinum Visa card for each purchase. Save money by getting 3% back at the pump, 2% on groceries and 1% on all other purchases. This card has no annual fee, no balance transfer fees and the ability to redeem points for your choice of cash, travel or merchandise. Start getting the max on all your purchases today! Apply online or by stopping in any branch. *Cash advances not included. Maximum earned on first $500 spent on gas per month, 1% after maximum is reached.